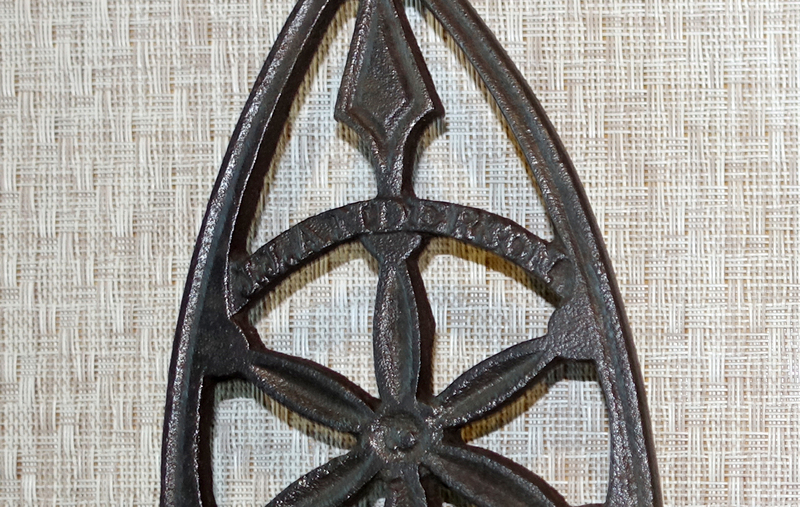 Here are two interesting antique cast iron trivets I recently won at the Eckstein Pressing Iron & Trivet Collection auction, held before the 2016 PITCA Convention. Denny & Janet Eckstein are from Ohio; their lifetime collection included pressing irons, trivets, fluters and other related items. Both of these trivets are new to me and perhaps to you as well. Their design and molding suggests casting in the 1880-1910 era. After photographing and cataloging, they’re going to a private collector in California. 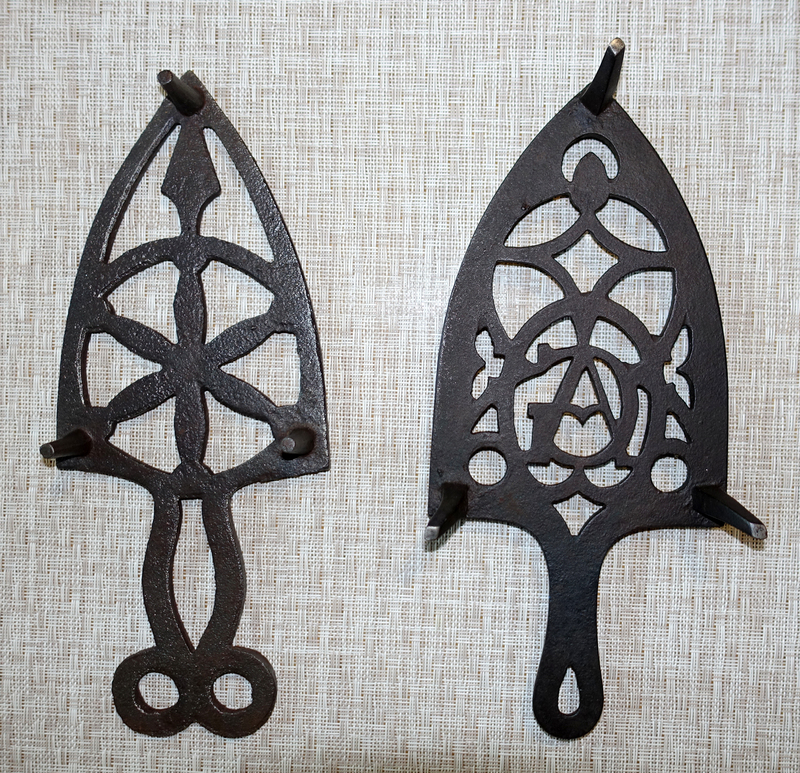 The design on the left features an arrowhead, a rosette and a decorative double-ring handle. It measures 10.5 x 4.25″ with three 1.375″ legs. Note the name J. J. Anderson on the face. There’s one gate mark along the lower left edge, near the left lower leg. An internet search reveals a person by the name of James J. Anderson of South Haven, Michigan who filed US Patent 733931 on 7/21/1903 for a furnace for melting metals. He was assignor for the Oil Burner Furnace Company of Wisconsin. Perhaps this bears some relationship to the name on this trivet! The design on the right features a life-sized acorn at the apex and incorporates the initials GA (or AG) in the center. It measures 10 x 4.5″ with three 1.75” splayed legs. It appears to have been cast through the edge. I’ve been unable to identify the significance of the letters, which may be a personal monogram but more likely signify a company. 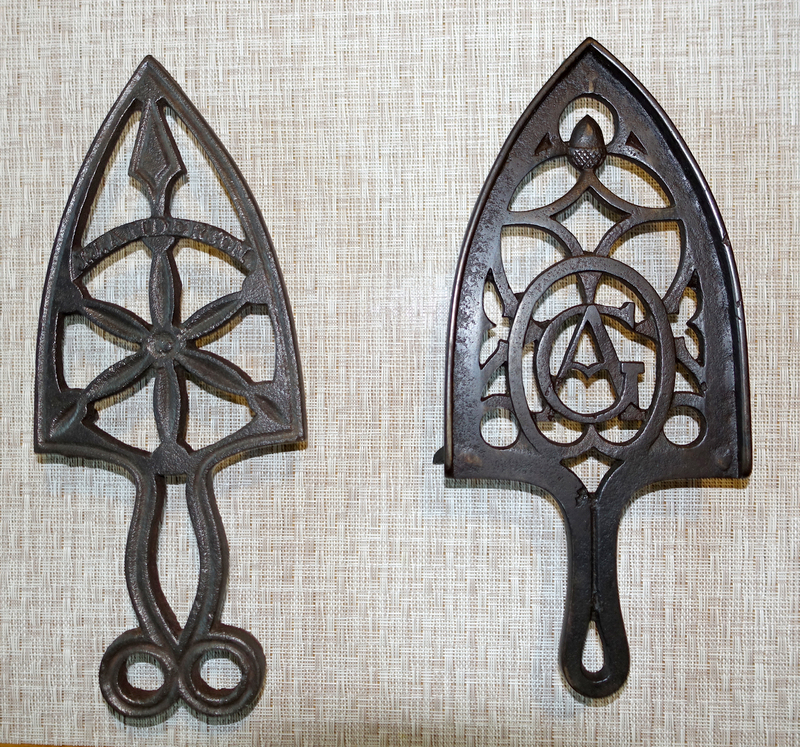 If anyone should have information on either of these trivets, please contact me. Thanks! This entry was posted on September 24, 2016 by Lynn Rosack in Antique Trivets & Stands and tagged cast iron.